A few days ago I received a Stanwell Black Diamond shape 185 in the mail, gifted to me from an Instagram friend. It was a pipe he’d bought as an estate and hadn’t touched. 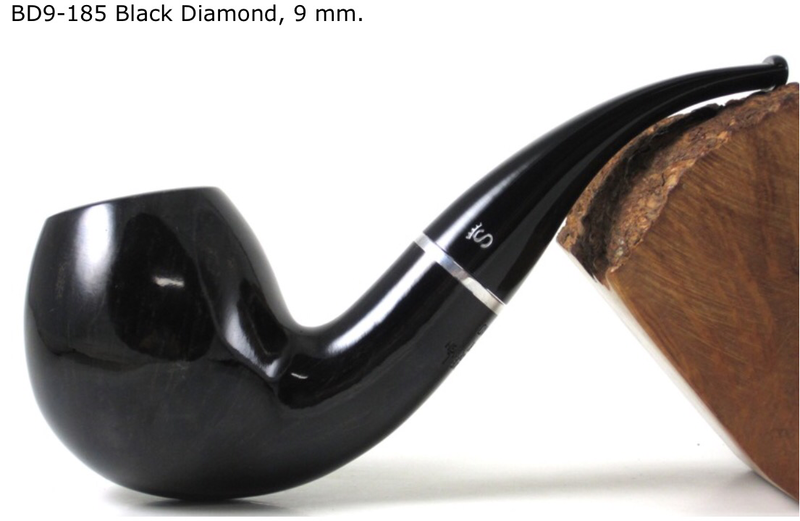 When it arrived it was a “dress black” pipe, covered with a matte black opaque finish that needed some TLC: the rim was a bit uneven from being bumped or tapped out, the finish was “thin” in a few spots, with the briar peeking through, and needed to be cleaned internally. I thought I was going to do a quick clean up and smoke it but the story developed into something more soon. So I didn’t plan on all that I ended up doing and didn’t take photos. I even forgot to take a before picture so I’m using a “stock” picture of this model. I cleaned the bowl, stem and shank first. This pipe had almost no cake and was not very dirty at all; it took only half dozen or so pipe cleaners to get it done. As I said before, I thought this was be a really fast job when I saw how little use the pipe had had. But it, of course, didn’t turn out quite so simple. I wiped the stummel down with alcohol to clean off the surface and prepare it for a treatment with a new idea I had: colored wax. Some time back, Steve had mentioned to me about a product that Hobby Lobby carried that was a rub on/rub off wax that comes in different colors and might be good to highlight stem or shank nomenclature. I picked up a tube of black and have tried it once or twice with less than great results. But I thought it might be just the thing to touch up the black finish on this pipe and shine it up, too. The alcohol removed a little of the black coat but not too much as I cleaned it so I knew the finish was removable at this pint, in case the idea didn’t work. After the briar dried I rubbed the ebony wax onto the pipe, let it haze and buffed it off by hand. I did about three coats of the wax and wasn’t really thrilled with the pipe, even though the color “took”. The bumpy rim was irritating to me and I knew it would continue to be a distraction. Although I was worried about what lay under the opaque finish, I decided to top the bowl and go from there. The newly smooth rim pleased me and I couldn’t help but wonder what was under that black coat. So I began to sand the black away to see. The coating was fairly thick and took some time to remove. I sanded with 220 grit paper until the black was mostly gone. It was a pleasant surprise that no fills were under that coat. In fact, the grain was pretty nice. So I moved on to 400 grit paper and then buffed the briar with tripoli to see how it looked; it was nice and the black would make a great contrast stain. I wiped the pipe down with alcohol again to remove the wax and dust and started sanding with 600 grit paper. After I was happy with the smooth surface of the pipe I removed the tape I’d applied earlier to the stamping to protect it and began to work gently around the black patches under the tape to make as little damage as possible to the nomenclature but break up the black. I mixed up some Fiebing’s dark brown leather dye with isopropyl alcohol in a 1:3 ratio. I applied and flamed the stain several times to get a nice, even coat. Then I wiped the bowl down with alcohol wetted pads until I removed enough due to see the grain well. I moved to the buffer where I buffed with tripoli and white diamond before laying the stummel aside to deal with the stem. The stem on this pipe is acrylic and was in good shape; there were no major scratches or tooth dents so I polished it with plastic polish and then reassembled the pipe. Then the entire pipe got several coats of carnauba wax and buffed to a shine on a clean flannel buff and then a bit more by hand with a microfiber cloth. I’m really pleased with the “undress” pipe. And I’m relieved that the briar under the “coat” was as nice as it is. This large, heavy pipe will now have a spot on my rack, to be used and enjoyed, something that it hasn’t had much of in its life. 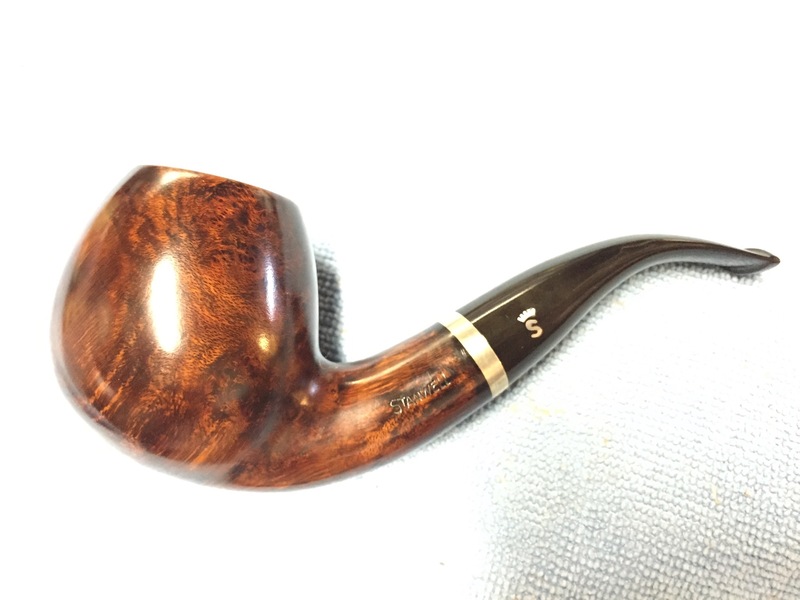 This entry was posted in Examples of Refurbished Pipes, Pipe Refurbishing Essays and tagged refinishing a bowl, restaining a bowl, sanding a bowl on December 12, 2014 by Greg. One of the forums I belong to has started a group project: carve our own pipe from a kit/pre-drilled block. It’s just getting started but one thing has become apparent to me: lots of folks want to try but are at s loss as to where to start. The whole idea here is to have fun and get started with a minimal amount of tools and money invested for the real beginners. It seems lots of folks think that a lot of large, expensive machinery is needed to make any pipe. While the professional pipe maker may have and need these, the DIY-guy/gal doesn’t need a lot to start from a kit. My son has carved three pipes and I have carved one, all using hand tools, not counting the buffer. I thought that a short list and video might be helpful to any want-to-try pipe carver. All of the tools except one can be found at Home Depot; I use them as the example because I bought it looked up most of them there/on their website. The exception is the vulcrylic file which I got from Amazon.com. There are other sources for tools and sandpaper etcetera but this will get you started. The blocks/kits are available from a variety of suppliers, too, including but not limited to PIMO, Pipe Makers Emporium, and Vermont Freehand. These sources, with many others, also sell various finishing products such as dyes and waxes. But again, this ought to get one off on the right foot. This entry was posted in Self Carved Pipes and tagged carve a pipe kit, pipe carving, tools on December 12, 2014 by Greg.